I will soon need a new car, and I’m not looking forward to having to choose one. Not only are there many different model ranges, but within each you have a million choices. Let’s say you’ve decided on an Audi A3. Great. Now would you like that as a 3-door hatchback, 5-door Sportback, 4-door Saloon or 2-door Cabriolet? And then once you get onto engines and trims you can have a real headache. It was hard enough for me to decide which model to test! In the end I went for the A3 Saloon S-Line, and then I set about giving it a thorough test. The Saloon is the nicest-looking variant in the line-up. As cars seem to grow over time, the A3 saloon seems to be the perfect size. The proportions are spot on, and with S-Line styling it really looks the business. At the front, sculpted headlights sit either side of the gaping, shouty grille. The front bumper is bold, angular, and looks menacing in a rear-view mirror. To the side there are clean, sweeping lines from front to back, and slightly broad shoulders which house the optional 19-inch alloys (£1,100) superbly. At the back the boot lid is curved and incorporates a subtle lip spoiler. Again the lights are sculpted, and a stylish shark-fin aerial sits neatly on the roof. A twin exhaust pipe sits to one side of a sporty bumper. What I like about the A3 is that it looks compact and sporty, yet executive at the same time. 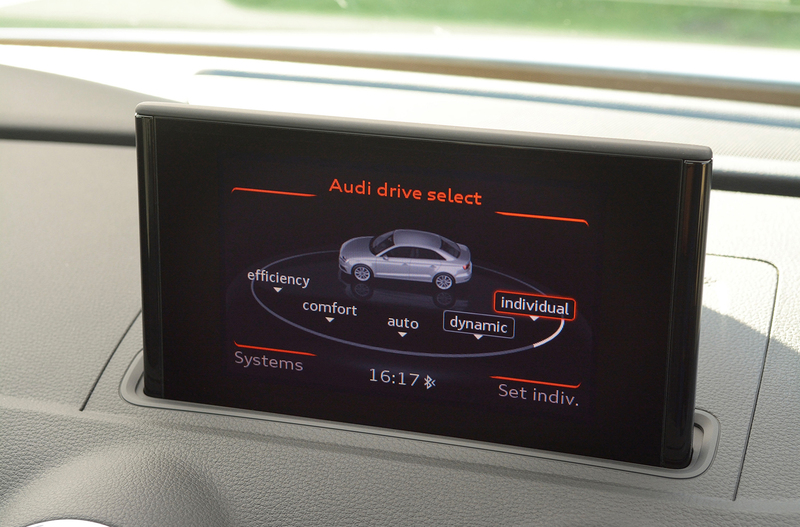 Step inside the A3 and the revised interior is rather easy on the eye. The optional Nappa Leather Sports Seats (£1,220) instantly grab your attention; they are sculpted, body-hugging numbers with quilting, contrast grey stitching and brandish the S-Line motif. The steering wheel is flat-bottomed, and the centre section has shrunk. The dials in the A3 are a work of art. Called the Virtual Cockpit, it is a full 12.3-inch TFT display, included as part of the Technology Pack Advanced (£1,395). The dials themselves can be small or large. In the background you can have a map, satellite navigation, media information, trip information and communication services. To look at the display is crisp and clear. The materials used are of the high-quality you’d expect of Audi, and subtle touches such as turbine air vents make the interior as stylish and sporty as the outside. Put simply, it’s a wonderful place to be. There are many engine choices in the A3, ranging from the 1.4-litre TFSI petrol to the 2.0-litre turbocharged unit from the S3. There are several diesel engines in between, one o f which was featured in my test car. It is a 2.0-litre, turbocharged diesel unit producing 150PS and 340Nm of torque. It was sent to the front wheels only (Quattro 4WD is an optional extra) via a 6-speed dual-clutch transmission. It’s not a great deal of power, but the gearbox uses it surprisingly well, getting from 0-62mph in 8.8 seconds and on to a top speed of 139mph. Gear changes are instant and seamless, and power delivery is smooth thanks to the torquey engine. It does feel a little underpowered at times, but there is a 184PS diesel and a 190PS petrol available should you need a bit more oomph. essively as it gets round them. fuel in traffic and around town. Opt for the 19-inch alloys and the economy suffers slightly. Combined fuel consumption is 60.1mpg, and CO2 emissions are 121g/km. That’s VED band D, and that means £110 road tax (free in the first year). All things considered that’s not all bad, but it does seem a shame that the nicer wheels cost you each year. That being said, when the new vehicle tax comes into force in April 2017, it will be less of an issue. As I mentioned earlier, all cars seem to be getting bigger. So whilst the A3 looks compact and well-proportioned, it’s actually a decent size inside. Both front and rear passengers have plenty of head and leg room. I had absolutely no issues in the back, but admittedly I’m only 5ft7in. Being a saloon the boot is rather generous, but it also has a limited opening. 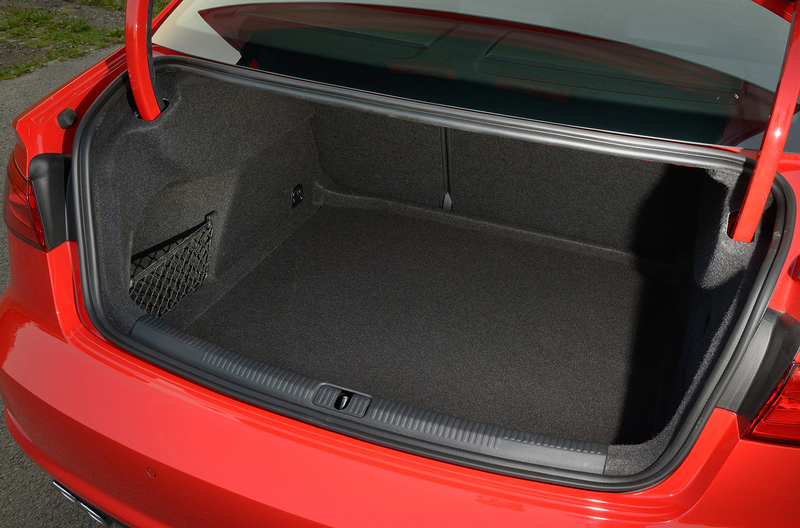 The downside to the saloon is that the boot is no use for the dogs; it’s all a bit windowless. With optional park assist (£125), heated front seats (£300) and auto-dimming rear-view mirror (£125) life is good behind the wheel. If you want to spend a little bigger then there is the Driver Assistance Pack, which includes adaptive cruise control, traffic-jam assist, lane assist, auto high beam, blind-spot monitoring, road sign recognition and emergency brake assist. It costs £1,950 but really makes the A3 a dream to live with. And that brings my week with the A3 Saloon to an end. I have to say I was very impressed with it. I’d go as far as to say I would pick one over an A4. You could certainly have a higher spec A3 Saloon for the same money. That being said, you have to be careful of getting carried away. The base price for the 150PS S-Line S-Tronic is £28,700. There are so many options to pick, and if you tick a fair few then you will soon find yourself the wrong side of £40,000. For a diesel A3 that’s a bit silly, but then some options, such as the Bang & Olufsen stereo and those Nappa Sports Seats are just too good to ignore. For more information see a local dealer, or to configure your very own A3 Saloon head over to the Audi website. And if you’re in the market for an executive saloon, I suggest you do so. The A3 might not be your first thought, but it’s definitely a good choice.